When Jane, Stephen’s support worker rang me to say that Stephen was dying, I thought she meant he might be dead in two months. I said I would visit him the following week. I had last seen him six months earlier. He was slightly drunk at the time and his skin a bit blotchy, yet he was cheerful, with ambitious plans for improving his flat. I was shocked by the news and talked on for a bit, but at the other end of the phone there was one of those jarring silences when you suddenly realise that you have missed the point. ‘No, no, he’s dying now. You need to see him today’. So I cancelled my morning appointment and took the train to West Norwood. As I came off the train I could see the ambulance outside Stephen’s block. Inside the ambulance they were busy making him comfortable on the stretcher bed. A mask was clamped to Stephen’s face and his breathing was accompanied by a sickening rasp. He was a stomach-churning yellow-brown colour, the colour of someone whose liver is damaged beyond repair. The ambulance crew allowed me to stay in the ambulance as, with siren shrieking, we raced through south London. I squeezed his hand and he silently wept. ‘This time I’ve gone too far’ he said, and it was difficult to disagree, though in fact Stephen lived another ten days in hospital before eventually dying. He was 52. Over the coming days, we talked a lot about Stephen who I had first met when he slept rough in central London in the 1980s. I felt wretched that I hadn’t realised how ill he had become. How was it, I asked Jane, that he deteriorated so rapidly? His drinking had been getting worse but then he moved onto ‘the cider that’s never seen an apple’ she noted bleakly. Ah, the cider that’s never seen an apple. The white super-strength ciders, favourite tipple of street drinkers, along with the super-strength lagers. White Ace currently leads the way. A litre of this pernicious fluid costs around £1.15. The white ciders are mostly 7.5% in strength, and the lagers – Tennent’s Super, Kestrel Super, Skol Super and Carlsberg Special Brew, are a massive 9%. These drinks are extraordinarily strong, remarkable cheap and absolutely deadly. In fact the white ciders do contain a form of apple but are a completely different product to the real ciders made from 100% apple juice. Instead, they are made from dry apple pulp and apple concentrate with most of the alcohol provided through the addition of glucose or corn syrup. It is remarkable that the cider industry has allowed these grossly inferior products to be described as ciders and for the brand to be tarnished as a consequence. Thames Reach has campaigned relentlessly against super-strength ciders and lagers since 2005. Every year in projects for the homeless across the country there is a cull of homeless men and women who die an early and often excruciatingly painful death as a result of the damage caused by these drinks. It wasn’t always like this. The rise of the super-strength drinks is a relatively recent phenomenon. When I was a street outreach worker in the 1980s they were virtually unknown. Of course, alcoholism amongst the homeless is hardly new. But what is different is the speed of the deterioration caused by the super-strength drinks. Consuming them is akin to pushing the fast forward button on your life. The damage is rapid and relentless. The vital organs, notably the brain and the liver, are quickly damaged beyond repair. The age of death is usually the forties and early fifties. I would be in denial if I were to pretend that our campaign has been anything other than a failure and this despite the fact that the solution is obvious and backed up by incontrovertible evidence. Every major piece of research into consumer behaviour relating to alcohol shows that consumption is sensitive to changes in price. If the price of super-strength drinks was at to at least double so that, for example, a can of Tennent’s Super cost £2.30, then people seriously addicted to alcohol would move over to weaker, cheaper lagers and ciders. It is so much easier to help people take further steps towards abstinence and recovery from the platform of weaker alcoholic beverages. The rate of deterioration slows and behaviour improves. The campaign has received welcomed support, notably from GPs, health workers and frontline staff working with the homeless. It is a campaign that has suffered through my own naivety. At an early stage a sceptical colleague gave his opinion that the government was in thrall to a drinks industry that would never countenance the kind of price hike we proposed. Over the past five years I have had a lot of contact with representatives from the companies in question and with the Portman Group representing the responsible drink companies, which include those producing the super-strength lagers. On a number of occasions in ‘off the record’ conversations, representatives from the industry have told me how they, personally, agreed with our position and that the heavy price we pay due to the availability of cheap super-strength alcohol, measured by the impact on health and increased anti-social behaviour, is unacceptable and unsustainable. In 2008 we made an official complaint to the Portman Group about the marketing of super-strength lager. Our case was based on the contention that to produce these drinks in 500ml cans, requiring the drinker to consume 4.5 units of alcohol and therefore go beyond the daily safe-drinking limits of 2-3 units for women and 3-4 units for men, encouraged binge-drinking and drunkenness. We lost, of course. The Portman Group concluded that it was difficult ‘to make a reasonable and objective distinction on responsibility grounds between a can of strong lager and …..other types of drinks container’ citing a bottle of wine as an example of a container that, like a can of Tennent’s Super, wasn’t easily re-sealable. I debated this issue a few weeks later on the Today Programme on Radio 4. ‘Don’t you put a cork in a wine bottle to re-seal it?’ asked the presenter Ed Stourton. I almost felt sorry for the Portman Group representative, squirming with embarrassment as he sought to defend a judgement that was bizarre and illogical. The complaints panel did however have some criticism for the producers of Kestrel Super. The panel was of the view that the packaging of the product included too many references to the strength of the drink and that this was reinforced ‘by the prominent stern image of a kestrel on the can’s front’. (I kid you not). They asked for changes in the packaging. As a shabbily blatant attempt to placate a complainant by offering up a change of breathtaking irrelevance, this example must surely win top prize. There is just one piece of good news. One of the white ciders, White Lightning, often referred to by street drinkers as White Frightening because of the feelings of paranoia it brings on, has been taken out of production. Creditably, the company that produces it, Heineken, cited the need to reinforce its stance on responsible drinking as the reason for taking this step. 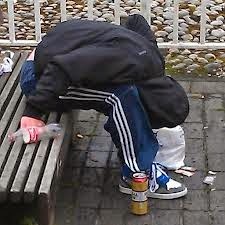 But here we are in 2010 with super-strength ciders and lagers continuing to lead the way as the most deadly of the drugs that cause death and mayhem amongst the homeless population in this country, ahead of both crack cocaine and heroin by a country mile as measured by number of lives extinguished. Despite the Conservatives in opposition unveiling what at the time (August 2009) the Daily Mail called radical plans to crack down on binge-drinking culture by trebling taxes on the super-strengths to increase the price of a can of super-strength lager by £1.30, ours is a campaign that has no more than ruffled the feathers of the drinks industry and failed to persuade the government to take a step that carries with it the politically potent taunt of the nanny state in action. I’m sitting outside a café near Aldgate East tube station with a cup of coffee and a newspaper. It is only 7.30am but he staggers drunkenly towards me clutching the familiar can with that logo which we will forever refer to sardonically as the stern kestrel. He finds a step on which to slump and his body sways downwards towards the pavement as if a great weight is attached to his forehead. I am practiced at looking behind the grime now. He may at first sight look 55 or even 60, but I can see that he is actually no more than 35. He tries to focus on the people scurrying past, who eye him warily. He bellows. It’s the most dismal sound. Later he will lay prostrate in Altab Ali Park, stepped over and passed by. Within ten years, unless by some miracle he can stop drinking, he will be dead. There may be more battles to come, but for the moment my coffee tastes very bitter. It is the bitter taste of defeat. Most people are oblivious of the crippling effects of alcoholism. This is a well written and informative article. I worked for a year and a half in a high-tolerance hostel in Belfast, and your article brings back some poignant memories. The general public are blissfully unaware of what goes on on the streets. Those who have worked with this section of the community know the vicious cycle that exists, and how difficult it is for disadvantaged people to claw their way out of its seemingly endless maze of misery. Alcohol ruins lives and strong alcohol ruins lives faster. I'm up for having another go at doing something about it if you are? Thanks so much for your kind comments. You're absolutely right about the lack of awareness amongst the public about the impact of these drinks. People are frequently amazed when I explain that they are twice as strong as the stronger ales you can buy in the pub. I went to a roundtable discussion at the Treasury yesterday to try and persuade them to tax these drinks at a higher level. It will be an uphill struggle. The main piece of evidence we have to collect is this: When people stop consuming superstrength drinks do they then start drinking twice as much of the weaker drinks to compensate? If they do, why increase the price (is the argument) but if on the other hand they drink around the same volume but their health and behaviour improves as it is weaker, then that would justify an increase in price of the superstrengths. Our experience is the latter - the volume stays around the same, it doesn't increase when they move to weaker brews. But we need strong evidence of this. Not easy. I work for Cambridge Council, i find the story, well, no surprise. This is what saddens me the most. It is happening everyday to vulnerable adults who look to cheap drinks as an escape. I am delighted to hear white lightning has been removed, hears to hoping its the first of many to leave the shelf. I was interested if you have any statistics about the sale of super-strength largers. Also, will you be attending the 'ending rough sleeping locally' conference in London on the 19th October? Check out my blog please I would be grateful for your advice. Jeremy whilst I had a sabbatical from street homelessness work in the City I went to work in Oldham, running a drug and alcohol project. The mainstay of the work was harm minimisation, mainly from drugs but the situation regarding alcohol was astounding. Don't get me wrong, I have worked in this sector for donkey's years but the destruction from alcohol staggered me. The insidious nature of the industry that prays on those most bleak of people, the chronic alcoholic, is breath-taking. If you closed every second place that sold this poison in Oldham you would still only have a block or two to stumble. The windows of every corner shop doesn't yell out their products, just starbursts prices of six packs, 2 litre bottles of chimera apple juice and BOGOF offers. I managed a team of 32 people in Oldham, most of who worked on the Drug Intervention Programme and in the counselling teams; I had just three workers dealing with alcohol. Yet there were not dealers on every corner - though a problem it was and there was only a tiny portion of physical crime committed by drug users, but the mayhem of alcohol was everywhere, domestic violence was rife, assaults rampant and general disorder abundant. To be honest the ingrained malignancy of alcoholism was not really acknowledged by a community very much in denial. The main street, Yorkshire Street had venues in a price war with prices still hovering around the £1 a pint mark just three or so years ago. The result, the street cordoned off on the weekend (Thursday to Monday) with police units marshalling the chaos, the drinks on draughed being the super strenghs available in the cans..oh and there was a military style hospital there through December. I know no one who went out in Oldham who was not intent on reaching a state of oblivion. I still have a drawing, completed by a Robertson Street resident in one of our art groups, during the years I worked there. It is a very telling pencil drawing of a dishevelled man standing next to a bottle of alcohol which is the same size as him. What a desperately sad tale, I think it's great that you're raising awareness of the huge widespread problem of homeless, particularly in the capital. Thanks. It's still the case that most of the public have no idea how strong these super-strength drinks are and that the 'market' is almost wholly made up of poverty-stricken, addicted men and women. Hi Jeremy, It's true that making alcohol available and cheap makes it more damaging. Struggling to break free of how entrenched alcohol is in our society is hard enough without discounted super drinks. Enough, I say - enough! Thanks for your comment. We are making progress at last with some of the main producers of super-strength drinks at least prepared to meet with us and one company, Heineken, showing the way by taking off of the market two super-strength ciders - White Lightning and Strongbow Black. We are hoping that others will follow. Very sadly, we have witnessed more deaths. Of the 14 people who died in our hostels in the last year, 11 died of illnesses brought on by the consumption of super-strength drinks. Basically their internal organs ultimately collapse under the impact.